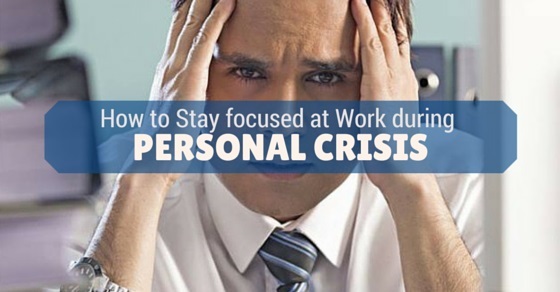 How to Stay Focused at Work during a Personal Crisis? Personal crises are unavoidable incidents of our life but often due to it, our professional front suffers heavily. Some of us manage to strike the correct balance between the two but some just get torn apart and mess up everything. For those who need guidance on how to manage both like a master, here are the listed points that you should take care of. Eventually you will be two people in one. One who handles professional life and one who handles personal front? You got to train your mind to remain in focus. It will be definitely tough in initial days since your mind would unknowingly allow you to drift away from present and worry about the crises but, try to be more focused. Once you start trying, you will be able to control your mind gradually. This is will bring focus in your work, eventually. You got to give yourself some time. Go step by step and you will eventually succeed. It is vital for you to spend some time in solitary and calmly figure out things. Instead of forcing yourself to be normal at a stroke, work on yourself. Dealing with problems alone will be difficult but, if you begin to share your discomfort with your dear ones they can certainly help you out. Even if they are unable to help you then also, sharing will lessen your burden making you focus more on your work. That is why do not feel hesitated to share your problems. They might just help you in a much needed way. You might be having relatives coming on and on or friends asking you to meet up but it has to be your call that how much time are you willing to spend. It is not at all feasible if you spent hours and hours with them and making your work suffer. Set your own time limits and adhere to that religiously. Wasting too much of time will only bind you with the crises even more. Treat your work as a way of escaping from the situation. If you are sitting idle chances of you thinking and rethinking about the problem is huge and that is the reason why you must find ways of making yourself busy. While you get busy in the work, you will hardly have time to think about it and this will save you from the mental stress that you are going through. Keeping a support system beside you is a wise decision. Most of us try to run from the situation and people, which causes increase in the level of stress. Rather having a support system, be like any family member or a group of friends whom you trust, will be helpful. They can not only help you gain mental stability but can also help you out in your personal work . You must learn to delegate your responsibilities to your team members. There might be days when you would feel like doing everything all alone but in the times of crises when you have no option left and things are taking strain on you, it is best to delegate your authorities and responsibilities to others. This will not only release you from the pressure but would also ensure the same level of efficiency in work. By doing this, your work won’t suffer due to your personal problems. You must successfully prioritize your life. Think of what is the most important thing i.e your job,works that are assigned, etc. If you do not prioritize carefully the result will be jumbled and chaotic. In which, neither your personal life nor your professional life is going to sound good. That is why set your priorities and work on it accordingly. Health is important and thus you got to take care of it wisely. A frequent visit to doctors can help you in overcoming the distress that you are going through. Medical help can also help you in re-energizing and focusing on your work properly. Dripping level of health is not a good sign, and in order to function properly you must give priority to your health without fail. You are slightly misbalanced at this point of time which is why you got to begin by focusing on smaller tasks. Instead of taking a bigger responsibility with constrained deadlines try taking smaller duties or at least delegating that one bigger responsibility. Focusing on smaller tasks will help you gain your lost efficiency and boost up your morale while on the contrary if you take a big responsibility and ended making a blunder out of it, chances of you feeling discouraged is even more. If you feel like exhausted mentally, it is best to take break. Your mind needs to be relaxed and it should get time to recover. Taking a break and going out on a vacation or merely moving to a friend’s place can help you a lot in relaxation. Once you feel better you can anytime come back and rejoin your work. Taking break will help you figure out how to move on or at least how to tackle with the problem. Once you do that, it will be finally easier for you to bounce back and work with greater efficiency. Giving your time can turn out to beneficial in lot many ways. Spending time on things that you enjoy doing the most. Giving time to your hobbies can help you nurturing peace inside you which has gone haywire due to personal crises. It will also allow you to shift your focus away from the crises and see the good things of life. A lot of us cut off from people once they meet crises on personal front which actually makes the situation even more badly. You may not wish to go to club and parties but, attend at least some friendly catch up with friends, traditional functions at home. This will first of all keep you busy in your life and secondly, it will give you strength to cope up while being around the people. Cutting off from people and taking up isolation will only make you weak and it will be difficult for you to get over the crises. Talk to the management about your concerns as well. This will keep them in the loop regarding your problem and they will also take care of the work pressure on you. While sharing each and everything is not advisable still keeping those at least with the knowledge can be beneficial to you. There might be colleagues and friends who would ask you about your problems, try gauging out who are true ones and who are simply interested to listen the stories. Avoid sharing too much details or discussing too much about your crises. You can surely have two three trusted friends with whom you can share your feelings but avoid making it a topic of discussions. Now you should do anything and everything to move on but ensure that you are not suffering in this. You got to make sure that you are taking as much sleep as needed to recover. Sleeping causes your mind to relax; it is the only time when the mind thinks the least. Depriving yourself from sleep and working, or spending nights after nights in worry is not at all good for your health. Dealing with crises is not at all a cake walk but somehow all of us have to go through these hard times and survive in our professional lives. While keeping yourself busy in work can be helpful since it is going to give you less time to think and over think, it is also essential that you are taking care of your health. Timely intake of meals, adequate sleep and some medical help can help you reducing the stress upon you. Do not feel hesitant in sharing your grief, or problem with your near dear ones. Ultimately you got to pull off yourself up otherwise you would end up sinking in the crises. Next articleHow to Write a Resume for an Entry Level Position Easily?